Pierre-Emerick Aubameyang scored a hat-trick as Borussia Dortmund beat Benfica 4-0 to ease into the Champions League quarter-finals with a 4-1 aggregate victory. The striker, who missed a penalty in the 1-0 first-leg defeat in Portugal, made amends by levelling the tie early on and then netted a third on the hour mark after Christian Pulisic’s smart effort. Aubameyang completed his treble with five minutes remaining, taking his goal tally for the season to 30 in the process, with a close-range finish. Benfica had chances to steal a precious away goal, Franco Cervi spurning two efforts, but Dortmund dominated the game and have now lost only one of their last 12 European home matches under coach Thomas Tuchel. 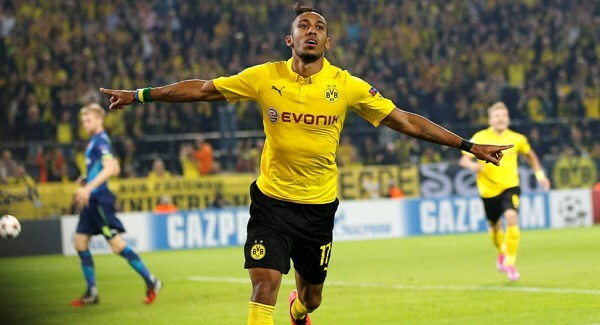 Pierre-Emerick Aubameyang celebrates after scoring. Tuchel, without influential playmaker Marco Reus due to a hamstring injury, said in his pre-match press conference that his side would attack and they came out firing from the off. They were rewarded in the fourth minute when Aubameyang headed in at the back post after Pulisic flicked on Ousmane Dembele’s corner. The hosts continued to apply the pressure as Marc Bartra headed over from a Dembele corner before the latter fired high following a quick counter-attack involving Aubameyang. But if Dortmund thought it was going to be one-way traffic they were mistaken when Benfica started to create opportunities. Roman Burki was on hand to save a Cervi shot in the 23rd minute and shortly afterwards the goalkeeper was tested by a Luisao header. Cervi had Benfica’s best chance just after half-time but, having seen the ball roll into his path following a sliced clearance from Lukasz Piszczek, the striker’s shot was brilliantly blocked as the defender redeemed himself. That kicked Dortmund into action and Aubameyang, having seen a bicycle kick fly wide, was denied by Ederson. But Dortmund went ahead on aggregate in the 59th minute when Piszczek slid in Pulisic and the 18-year-old brilliantly lifted the ball over the on-rushing Ederson. Two minutes later Aubameyang put the game out of sight from close range from Marcel Schmelzer’s low cross. Knowing a Benfica away goal could set up a nervy finish, Dortmund continued to pile forward and Gonzalo Castro volleyed wide.